This is a story about Zhang Chang, a noble official in the Han Dynasty who kept the country at peace for many years. Being faithful and out spoken, others officials were jealous and would find faults in him to report to the Emperor. Zhang’s wife was beautiful, everyday Zhang would touch up her eyebrow before going to work. 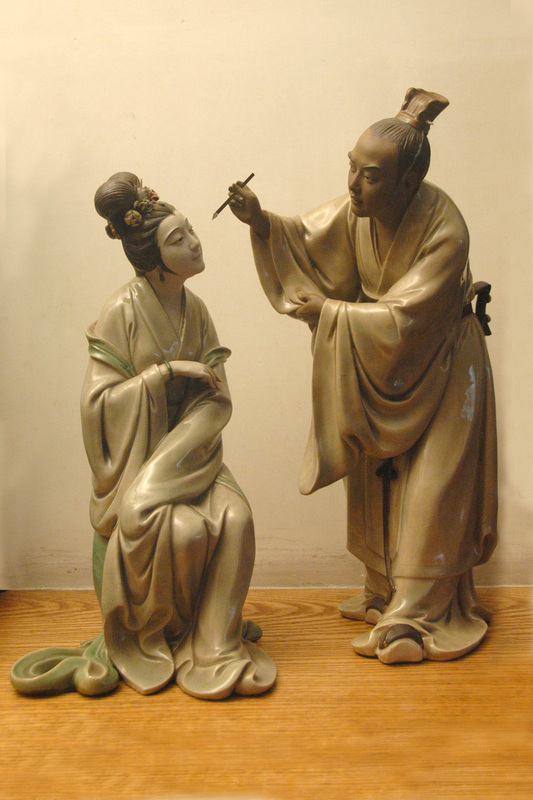 His rivals reported this to the Emperor and when he was questioned, he answered “there are more ridiculous thing a married couple would do in the bedroom, please ask me only about my duty, what I do with my wife is only my business.” Because of the nature of the story, it is a very popular subject for work of art. The Shi Wan area is famous for its pottery; its beautiful colour glaze, the fine detail and the capture of the gestures.